Home › Blog › Multicolor 3D printer filament – taste the rainbow! 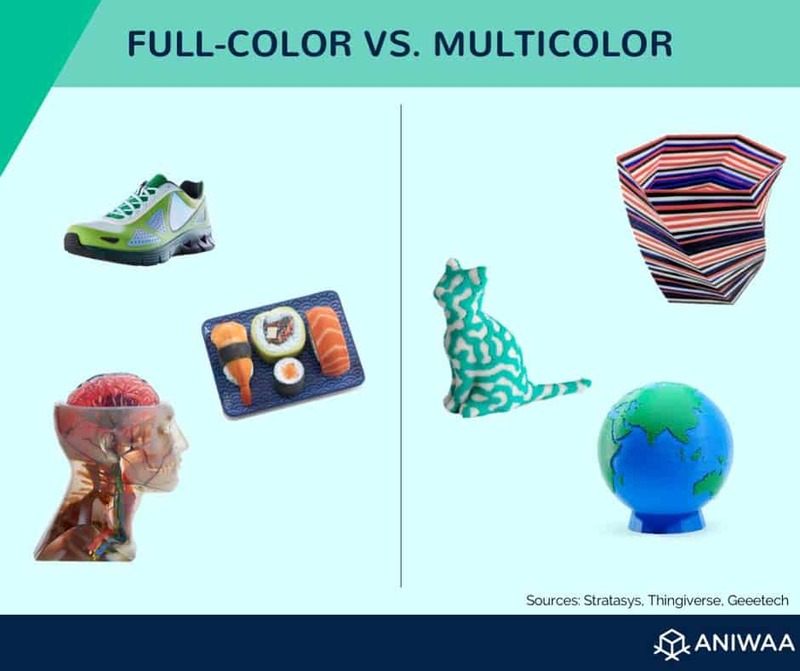 What is multicolor 3D printing? Multicolor 3D printing is 3D printing with two or more colors in one 3D print. This is different than full-color 3D printing, which we refer to as 3D printing with thousands or even millions of colors for photo-realistic 3D prints. 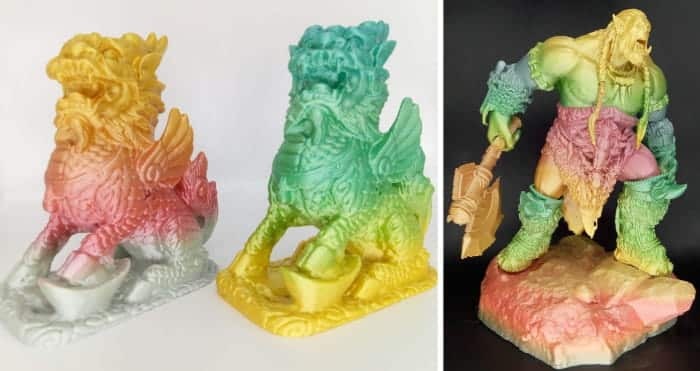 The difference between full-color and multicolor 3D printing. To obtain multicolor 3D prints, users require a 3D printer with a dual extruder or even triple extruder. It’s also possible to get multicolor 3D printing with special accessories such as the Palette or Prusa’s MMU (multi-material upgrade). For users who “only” have a single extruder, though, there are 2 options: using multicolor 3D printer filament, or the good old trick of manual filament-switching! Although it isn’t possible to choose where each color goes, gradient 3D printing can be a nice alternative to multicolor 3D printing. Gradient 3D printing filament spools offer various colors one after the other. However, users generally need to 3D print large objects (or smaller ones with a high infill percentage) in order to see color variations. Another option is to 3D print various small to medium-sized parts at once. 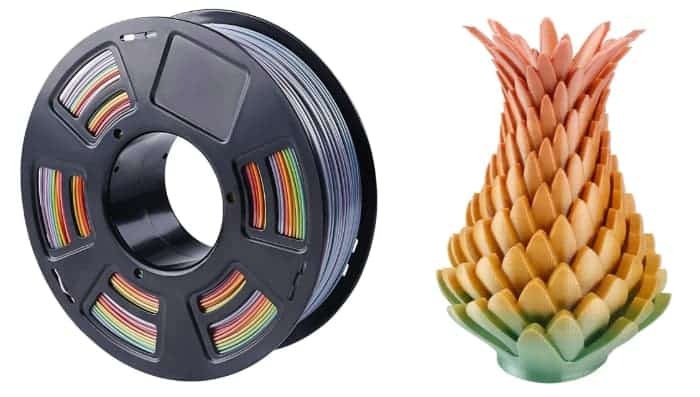 Here’s a short list of the best rainbow 3D printing filaments out there. This is one of the most affordable multicolor 3D printer filament spools on the market (check price on Amazon). Multicolor 3D printer filament: Multicolor Gradient Rainbow by Stronghero3D. 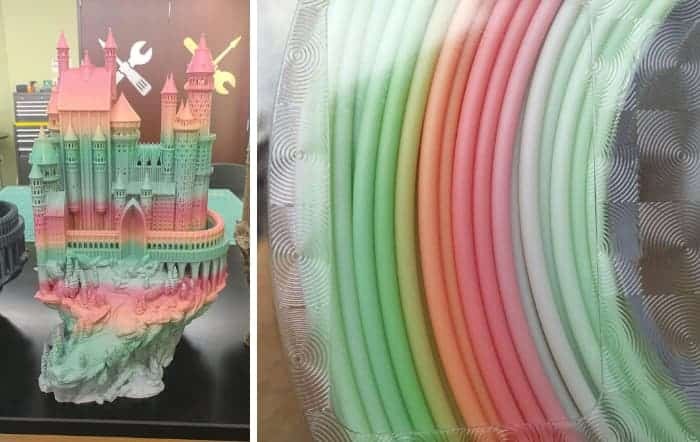 According to users, this multicolor 3D printer filament (PLA) from China requires special attention for print settings, but offers beautiful colors. There’s quite some distance between each color, so users may find it better for large 3D prints. Multicolor 3D printer filament: Multicolor PLA by Zi Rui. Texas-based FilaCube provides users a range of pastel colors with their Rainbow PLA. User reviews for this rainbow filament are highly positive. It’s possible for users to color white or transparent filament with permanent markers (e.g. Sharpies). This solution is a bit more complex and time-consuming, but it allows users to choose the exact distance between each color change. DIY rainbow filament technique by Makezine. Makezine gives more information on the process here: Coloring 3D Printer Filament. With special settings, it’s possible to tell the 3D printer when to pause the print in order to manually switch filaments. A growing number of 3D printers allow users to pause and resume 3D prints, but there are also many 3D printers that don’t offer this functionality. However, there are controllers and control board add-ons that users can install in order to pause prints if they wish. The MatterHackers standalone 3D printer controller enables users to pause 3D prints when and where they like. This 3D printer controller features a touchscreen as well as Wi-Fi connectivity. This control board isn’t standalone and must be installed manually on a RepRap 3D printer. It offers more precise control over the 3D printing process. The KINGPRINT MKS Gen V1.4 Control Board is available on Amazon. The Revolve by Thing-Printer is a high-end control board with Ethernet connectivity, four USB ports, and a range of superior components. This single board replaces its predecessor, the popular Replicape Rev B board from the same manufacturer. If you don’t have a 3D printer yet or are looking for a dual extruder 3D printer, use our 3D printer comparison engine to find the right hardware. Learn more about photorealistic color 3D printing in our full-color 3D printer article.